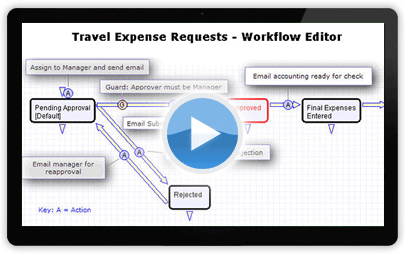 complex task workflows and business processes. Improve efficiency, performance, and communication across your organization. Agiloft provides a fully configurable and versatile framework to automate and manage even the most complex task flows and custom business processes. Powerful workflow functionality, customizable business rules, and flexible task templates work together to automate and manage any business process without the need for custom code. Agiloft's workflow functionality gives you the power to control status and state transitions. Agiloft makes it easy to trigger the creation of task templates or approval workflows as needed for each project type. can validate your data, trigger event- or time-based notifications, and update data in linked records or external systems. can be applied to any of your projects or workflow types, whether parallel or sequential. Required, optional, and ad hoc task types are all supported. Build your own custom workflow with Agiloft's easy to use drag-and-drop graphical workflow editor. It builds and documents the system's actual behavior as you design it, so you can automate new processes in record time, without programming. across your organization by automating frequently executed workflows such as new employee, partner, or customer onboarding. and eliminate duplication of effort by automatically integrating all of your processes with essential data such as employee and asset information. under a single extensible framework that adapts to evolving business needs without the need for programming. The biggest single benefit from implementing Agiloft can be described in one word: Efficiency. Integrated Time Tracking allows you to track billable and non-billable employee hours by client, project, task, or ticket to easily invoice clients, manage human resources, and keep projects on schedule. with automatic task assignment and alerts of upcoming deadlines, milestones, and deliverables. with a system that can be accessed anytime, anywhere, by team members around the world. by measuring costs and planned vs. actual performance with customizable reports and dashboards. We can now do in five minutes what took an hour before. Increase organizational agility, optimize efficiency, and improve performance with Agile BPM that dynamically adapts to evolving business needs. Administrators can make deep configuration changes using only a browser, so there's no need to bring in programmers every time your process changes. Easily manage the security controls necessary for your organization and provide users with the exact access permissions they need, right down to the field level. Find records that meet any type of criteria with sophisticated search capability, including historical searching. Drive your business rule actions through saved searches. Use Agile BPM to access historical snapshots, which display any record as it existed at any point in the past. Complete audit logs capture changes to any record and all types of system events. Agiloft BPM provides improved performance, security, and flexibility. Agiloft has flexible pricing packages to suit most budgets. Whether you're looking for a hosted cloud solution or an in-house deployment, Agiloft has an affordable plan for your organization. Organizations ranging from startups to Fortune 100 companies depend on Agiloft's Agile Workflow and Custom BPM solutions. Use Agiloft's Contract Management Suite to approve workflows and integrate contract information into related business processes to mitigate risk and ensure compliance. Agiloft supports RMA Management, Repair Tracking, and Parts Ordering to enhance visibility and control throughout all of your return, repair, and exchange processes. Use Agile SOX compliance to reduce the costs of regulatory compliance by automating, enforcing, and documenting your IT processes with a built-in audit trail.